Michael Corum, a leading author on management in the federal government, instructs federal managers and supervisors on how to identify and handle ethical issues with examples from real federal employee cases. 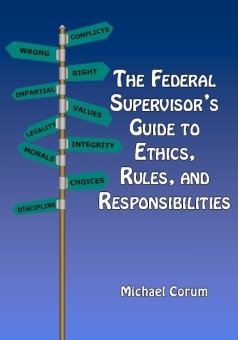 Ethics, Rules, and Responsibilities explains the basic sources of ethics rules in federal service. The major ethical issues facing supervisors and managers are explained. The text also details how to enforce the rules and deal with violations to avoid the most common mistakes agencies make in handling ethics violations.